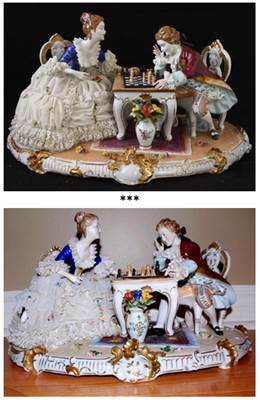 Unterweissbach Germany Dresden Lace Couple Playing Chess 9347 Porcelain Figurine. Blue crown mark on the lower back of the settee. A seal stating "Made In DGR". Measurements: 9 1/4" height by 16 3/4" width. Condition: Excellent with a hairline crack that starts from the base to under the ruffled hem of her skirt. Couldn't locate any broken laces or parts. Beautiful antique very large group figurine man and woman playing chess amazing detail made by Unterweissbach factory in Germany about 100 years old, item looks great but has damage to woman's lace on the back; other than that no more damage to it. This item before packaging is about 4.5 kilo, it is 17" long by 10 1/2"wide and 9 1/2" tall. Unterweissbach is a municipality in the district Saalfeld-Rudolstadt, in Thuringia, Germany. Unterweissbach porcelain is yet another example of a company that undergoes many twists and turns, success followed by bankruptcy followed again by even greater success. [Located] in the Thuringia region of Germany, home to other famous porcelain manufacturers such as Von Schierholz and Volkstedt, the Porzellanfabrik Unterweissbach was founded in 1882 by Herman Jost. Having started production making primarily dishes and kitchenware, the factory evolved to making some of the finest figural pieces in the famous history of German porcelain. In my archive of chess images I found four other auctions featuring this same porcelain piece. For the previous example of chess porcelain on this blog, see Napoleon and Josephine Biscuit (July 2017). The Knight, The Pawn & The Bishop © Flickr user Maureen Barlin under Creative Commons. Beautifully sculpted lanterns at Chiswick House & Gardens, London -- The Magic Lantern Festival, December 2017. The size of some of these lanterns is astonishing! For a similar photo of other pieces in the same set, see Anyone For Chess? (flickr.com). 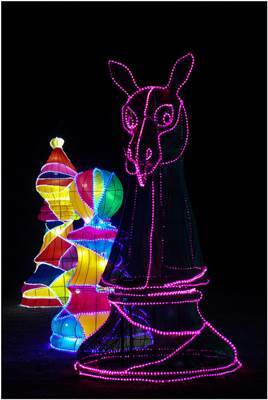 For info about the festival, see Magical Lantern Festival (magicallantern.uk). In last month's November Yahoos, I wondered, 'Will a Yahoo chess story turn up in December?' As the month continued, there were at least three stories grabbing headlines. Google's DeepMind team has already advanced its AlphaGo AI to dominate Go without human input, but now the system is clever enough to master other board games without intervention. Researchers have developed a more generalized system for AlphaGo Zero that can train itself to achieve "superhuman" skill in chess, Shogi (a Japanese classic) and other game types knowing only the rules, all within less than a day. It doesn't need example games or other references. I addressed this evolving subject in two posts -- Houdini, Komodo, Stockfish, and AlphaZero and The Constellation of AlphaZero -- and I'm sure there will be more. Will it ultimately result in chess being solved? The World Chess Championship logo for next year’s match is raising eyebrows with folks online. World Chess this week unveiled promotional artwork for its November 2018 title event in London. 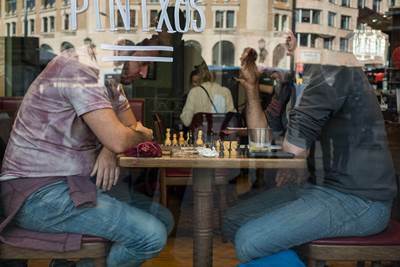 It included this image of two people around a chessboard, which some wags have dubbed "pawnographic". I also addressed this in several posts -- the last two were A Collection of Chess Logos and Dirty Mind Games -- and I hope this is the last I see of it. The logo doesn't deserve a long shelf life. Jerusalem (AFP) - Israeli chess players could make history by participating in a tournament in Saudi Arabia after the international chess governing body on Tuesday said it was pushing to allow it to happen. This was followed by a second Yahoo story on the same tournament. Dubai (AFP) - Saudi Arabia brushed aside rulings from top clerics to host a big money chess tournament, but the gambit to improve the kingdom's image has been jolted by regional powerplays. [...] But a refusal to give Israeli players visas, doubts whether Iranians and Qataris will come, and a no-show over Saudi Arabia's record on women's rights have all cast their shadows. That 'no-show over women's rights' received widespread attention. I saw it on three different network news stations, each one mentioning Anna Muzychuk by name. A two-time world chess champion has said she will not defend her titles at a tournament held in Saudi Arabia because of the way the kingdom treats women as "secondary creatures". Anna Muzychuk, of Ukraine, turned down the chance to travel to the event despite modest signs of reform in the kingdom under the young crown prince, Mohammed bin Salman. Why did FIDE award the event to a country with such a spotty score on relations, international and otherwise? For the answer we have to go back to a report on my other chess blog, 2017 FIDE Congress : Whither the World Championship (November 2017). I didn't cover it at the time, but the section of the minutes titled 'FIDE World Rapid and Blitz Championship 2017' mentioned that no bids were received. The Saudi bid must have come in shortly after the Congress ended. If you were in FIDE's shoes, what would you do -- cancel the tournament or accept the bid? -- knowing that cancelling the tournament would give FIDE an operating loss for the year 2017. I added a couple of widgets to the right sidebar. Is it possible to annotate them using a bird's eye view? Here's a look at the blog using yesterday's Merry Christmas post, along with a few notes. That's a long sidebar! For a previous iteration, see The Longest Sidebar (October 2011). For last year's Christmas post, see Christmas Watch (25 December 2016). And please remember to drive safely! The video summarizing the 2017 conference is the following. For the conference program, which lists all speakers in order, see 2017 Programme : London Chess Conference 2017 The videos from 2016, the year I missed, can be found on the same YouTube channel (the 'KVD' portion of 'KVDC'): Karel van Delft (search?query=london). Writing this post reminded me that I still haven't looked at all of the videos flagged in the recent post, Chess Educators of the Year (November 2017). That makes more than enough material to keep me busy during the yearend holiday season. How often does chess grab mainstream headlines twice in one month for different stories? Two weeks ago on Video Friday we had AlphaZero and A New Style of Chess. For this edition we have a controversial World Championship logo (and video). NOTE: This was meant purely as a silly joke to show how ridiculous the new World Chess Championship logo is. This is not meant to offend or be taken seriously as any kind of political or moral statement. It is just for comedy. Enjoy (or don't)! The new world chess championship logo revealed this week for next year's London match has drawn strong reactions from chess fans and the general public. I regret having to post this AGAIN, but ok, I will: This is obviously a SATIRE/JOKE to show how uncomfortable and impractical the World Chess Championship logo is. It is not meant to be offensive. It is meant to be silly - just like the logo. There is nothing more to it. Happy Holidays! Now go enjoy some chess! We love the logo very much. Don't worry if you feel it's a little bit controversial and you don't want, let's say, your kids to see it. It's not going to be a logo used in this place; it's going to be something different and this one is just limited editions. But again, collectors are loving it and we hope you'll love it too and also we appreciate the fact that chess is in the news in design media. I guess this is one more post that got out of control. Many people have been offended, and many people have been offended at other people's offendedness, and many people are offended by the fact that they could not find something to be offended about. And now I'm offended that we can't have interesting things happen in this world without people taking it to the extremes. So now I'm locking these comments. After this story was written and before publication, the "suggestive" world championship logo was announced, which surely would have made the list, and which shows that this interesting year is not yet over! Has a World Chess Championship ever generated this much attention a year before the match and months before even knowing who both players will be? Ninety-six logos of chess on the site! I might have overlooked one or two, but I counted the logos on my World Chess Championship site (see link on the sidebar) and came up with 96. Here they are in barely viewable format. Honestly speaking, they aren't all logos. There are a number of banners, like the seven to the left of the top row (A1-A7), and I invented a couple of those myself. The logo causing the current ruckus, the one that I mentioned in World Championship Branding on my other blog, is in the middle of the bottom row (G8). See, for example, World Chess Championship's 'Kama Sutra' logo criticised (bbc.com). My favorite logo is probably the panda shown last on the fourth row (D14). It was created for the fifth leg ('Beijing, VII, 2013') of the 2012-2013 Grand Prix. Many of the most interesting logos were created for women's events, like the 2011-2012 FIDE Women's Grand Prix (fourth row, D2-D7). As for the lack of logos from the 20th century, I've never made any systematic attempt to find them. I simply collect various images as I create the corresponding pages. The first event where I used a logo appears to be 1995 Kasparov - Anand PCA Title Match : Highlights (G9). I ended last month's kickoff post for a series on FIDE, Spectating the 88th FIDE Congress, with an idea for a follow-up. Later in the meeting, Ilyumzhinov gave a more detailed defense of his personal actions, but I'll save that for another post. You might recall that the controversy goes back to March/April 2017, when I documented it in a pair of posts on my two chess blogs: Did He Resign? and He Didn't Resign. Let's move forward to October 2017, and listen to more of the discussion started in the 'Spectating' post. Prof. A. Siegel [FIDE Treasurer; ...] proposed to the Executive Board in the interest of FIDE, we request Kirsan Ilyumzhinov not to run in the next Presidential elections. He requested a secret ballot vote. This was discussed by the Board and seconded by the President of FIDE America: 'Mr. J. Vega seconded the proposal of Prof. Siegel.' Kirsan Ilyumzhinov began a long defense of his position. I hesitated about including it in its entirety, but there are so many fascinating elements here, that I finally decided to use it unabridged. President Ilyumzhinov said that the elections will take place in September 2018 in Batumi at the General Assembly. Officially the campaign starts three months in advance, when a ticket is submitted and a person declares himself a candidate. Officially the announcement should be made that a person is running or not running, three months in advance. Therefore there can be many candidates, and not only among those who are present here. He said he understands everything said by the members of the Presidential Board. He respects all said by Prof. Siegel and Mr. Borg, he understands the concern and he is also concerned but he has always defended the FIDE interests. The amount of his current travels is not more or less that during previous years, and he would like to underline that all his trips are in connection with the chess propaganda. The minutes suddenly switch from third person to first person. If you take any country he goes to -- be it Mongolia, Costa Rica, Zambia, Zimbabwe -- I meet with the leadership everywhere, make TV presence, popularize chess, speak at press-conferences, and no elections were discussed. Yesterday we spoke a lot with those present here, with my Vice-Presidents, and I fully agree with their concerns. I do not see any critical in the continuation of their work, to continue my travels, to speak about people, children, to give simuls, to bring manuals and chess boards as gifts. Of course you can make a motion and vote for it so I am forbidden to run in the FIDE Presidential elections. But why to vote, if I can refuse participating myself? Why to force me to do so? We are here in a democratic process. I hope the situation in the USA will also be clarified. I am under sanctions of one department in only one country, member of the UN and FIDE. Tomorrow any other country, a ministry -- of fire-fighters, finances, economics of Mongolia, Andorra, other countries -- will announce that someone of the audience is under sanctions. So will this mean that this person will have no right to run for the parliament, municipality, international organisations? I am not in prison, officially I was not accused in any point by any court, prosecutor of the USA, FBI, CIA. I replied to all their questions in London, Paris, Zurich, Moscow. I showed them my 40 passports and 1500 trips abroad, I wrote an official letter to the FBI director, so I am checked at polygraph, and invited to Washington. I came to London on purpose last year, as there is a FBI branch in London, to be tested at polygraph, to be interrogated. They refused. I wrote a letter to the U.S. President, to be invited, and asked him -- if the USA is a democratic country, please invite me and listen to me. If I am wrong, if I violated the U.S. laws, I am ready to go to prison. I am ready to go to prison for truth. But if the U.S. Dept of Treasury is wrong, they have to apologise to me -- this was my only request. A month ago I wrote a letter to D. Trump. I am grateful to the USA President, and there have been several hearings on my case in the U.S. Department of Treasury in the USA, in their Administration. Among those who was invited to this Congress, is my representative, a U.S. lawyer, who was ready to reply to all questions about the hearings, which were held in the Dept of Treasury and the U.S. President’s Administration. As you know, last May we had a Presidential Board in Moscow, and Candidates’ tournament. One of the EB members present here could not come to Russia because he was on a sanctions list of one of the Russian Ministries. I wrote an official letter to the President of Russia, and the head of this department and I succeeded to lifting of the sanctions from this person. I have recently visited several African countries, and there all their Presidents, all members of the governments and parliaments are under the U.S. and U.K. sanctions. But despite this, the members of these countries work in the international organisations, and are heads of banks. Therefore I am as a Russian, am under sanctions. In 2004 may of those present here, participated in the Presidential Board and World Championship in Tripoli. Libya was under sanctions, the chess players who played there, received money from people under sanctions -- son of Qaddafi, ministers, members of the Libyan Government, who sponsored the event, financed our World Championship where R. Kasimdjanov won. In March in Tehran we organized the World Women’s Championship (as Mr. Makropoulos mentioned), but despite the fact that Iran is under sanctions, despite their ministries were under sanctions, we received the money and organized the championship there. My lawyer Robert Amsterdam insists that the hearings are open, so that I could make a speech in the U.S. Congress and the U.S. Senate. I am ready to travel to the USA, to buy a ticket, so I wrote about it to the U.S. President. Therefore the sanctions policy carried out by several countries, is past, Stone Age. This is not only about me -- this is about many citizens of this world. When I meet presidents of countries, presidents of international organisations, they tell to me: "Don’t give up, fight against this administration, fight against the U.S. Department of Treasury". I have sent to all of you the list of points as basis for my inclusion in the list of sanctions. It includes only the Guardian publications and other Internet publications. Therefore I am open to come and reply to all their questions. And as I was told yesterday, the invitation has arrived to the U.S. Embassy in Moscow, and I hope that I will be able to visit Washington soon. As for my participation or non-participation in the FIDE elections, I should be the one to announce. This is my personal decision and my right, to participate or not in the elections. Maybe we can take a joint decision, and agree who we will all support, right here. But I do not want my rights to be violated or limited, as a Russian citizen, as one of persons who work in international organisations. When I travel to countries, I represent not only FIDE, I represent Kalmykia, where I have been President for 18 years, Russia where I have been a Parliament member several times. If I had been such a terrible person, a dangerous person, I would not have been received by Presidents and Prime Ministers of many countries. Therefore, if I hurt anybody, made some mistakes, please accept my apologies. But all my work since 1995 for 22 years has been transparent and all of you have witnessed everything what I have done. I was spending my time, my health, my fortune, money not to promote myself, but to support and develop our chess, our country. Once again I would like to underline -- if it is necessary, I will decide myself which I will take on my time -- to resign, to run or not to run in the elections. I am asking you not to force me. If you want, I will think, and can make an announcement myself -- we discussed this yesterday. But give me some time. I think all I have done during these 20 years -- give me a right to deserve a decent treatment and to request this. I thank you once again for your concern and for your speeches. I understand you were speaking sincerely, therefore I am with you. But allow me to take a decision on my own. Nowhere does Ilyumzhinov mention the specific accusations levelled against him, detailed in Treasury Sanctions Networks Providing Support to the Government of Syria (treasury.gov; November 2015), unless this is what he means by 'other Internet publications'. The accusations imply that he has been using his post as FIDE President, especially the travel privileges, to further his private business interests. As Ilyumzhinov said, the vote has no legal significance. It was basically a vote of no-confidence. As for the notion that sanctions don't work, why were they being discussed by FIDE's Executive Board? It sounds like AlphaZero might be the answer to my quest. What exactly do I need to install and run it? The 'Giraffe' post included a link to the paper announcing AlphaZero: 'Mastering Chess and Shogi by Self-Play'. Pages two and three of that paper included a three paragraph overview of AlphaZero's nuts-and-bolts. I'm copying it here as an image because it includes math symbols that I don't want to replicate yet. We applied the AlphaZero algorithm to chess, shogi, and also Go. Unless otherwise specified, the same algorithm settings, network architecture, and hyper-parameters were used for all three games. We trained a separate instance of AlphaZero for each game. Training proceeded for 700,000 steps (mini-batches of size 4,096) starting from randomly initialised parameters, using 5,000 first-generation TPUs to generate self-play games and 64 second-generation TPUs to train the neural networks. Further details of the training procedure are provided in the Methods. I had never before heard of a TPU, an acronym for 'tensor processing unit'. Before I go any further, I'd better learn a little more about these concepts that I've just bulleted. As usual, I'll call on Wikipedia to explain the basics. The introduction to deep neural networks is on a page about Deep learning. A deep neural network (DNN) is an ANN with multiple hidden layers between the input and output layers. Similar to shallow ANNs, DNNs can model complex non-linear relationships. DNN architectures generate compositional models where the object is expressed as a layered composition of primitives. The extra layers enable composition of features from lower layers, potentially modeling complex data with fewer units than a similarly performing shallow network. Deep architectures include many variants of a few basic approaches. Each architecture has found success in specific domains. It is not always possible to compare the performance of multiple architectures, unless they have been evaluated on the same data sets. DNNs are typically feedforward networks in which data flows from the input layer to the output layer without looping back. So a DNN is based on an ANN, but what's an ANN? It is explained in the preceding section of the same page. Now here's an explanation of Monte Carlo tree search. TPUs are explained in a page describing a Tensor processing unit. A tensor processing unit (TPU) is an application-specific integrated circuit (ASIC) developed by Google specifically for neural network machine learning. Compared to a graphics processing unit, it is designed for a high volume of low precision computation (e.g. as little as 8-bit precision) with higher IOPS per watt, and lacks hardware for rasterisation/texture mapping. The chip has been specifically designed for Google's TensorFlow framework. While I was poking around in various documents, I kept running into that word, 'TensorFlow'. It's explained in another page, TensorFlow. TensorFlow is an open-source software library for dataflow programming across a range of tasks. It is a symbolic math library, and also used for machine learning applications such as neural networks. It is used for both research and production at Google, often replacing its closed-source predecessor, DistBelief. TensorFlow was developed by the Google Brain team for internal Google use. It was released under the Apache 2.0 open source license on November 9, 2015. The Wikipedia page on TPUs also says, 'Google's TPUs are proprietary and are not commercially available'. Looks like I'm not going to be installing and running AlphaZero anytime soon. Basically, it's a neural network that uses a Monte Carlo search to evaluate chess positions. The idea isn't completely new, but Google's DeepMind was the first to make it work. The excerpt I copied from the paper also talks about parameters. It ends, 'The updated parameters are used in subsequent games of self-play.' I wonder if I can find out more about those parameters. I'd also like to know how all of this was used in the match that crushed Stockfish. ...I was starting to wonder if we had entered some brave new world of chess auctions. With the item pictured below, we revert to the sort of auction that has kept the series on 'Top eBay Chess Items' running for so long. 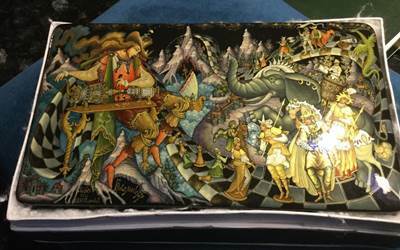 Titled 'Russian Lacquer Box by Zhiryakov Alexey "Grandmaster" Palekh Chess Circus', subtitled 'Wow what a box. Use pics as your guide. Fantastic. This is as good as they get. Really! ', the box sold for around $975, 'Best offer accepted'. This auction is for another one of the owners favorites from Palekh by Zhiryakov Alexey. Looks like a circus and chess game. Really the best artwork I've seen from Palekh. The drawing around the sides is more than exceptional. Also famous for his fairytale paintings. This one is a masterpiece and big: 8" by 4 5/8". The details are superb. Palekh miniature is a Russian folk handicraft of a miniature painting, which is done with tempera paints on varnished articles made of papier-mâché (small boxes, cigarette and powder cases, etc.) Palekh Russian lacquer art on papier-mâché first appeared in 1923 in the village of Palekh, located in the Palekhsky District (Ivanovo Oblast), and is based on a long local history of icon painting. Was born 1974 in the village of Palekh, Ivanovo region, where he currently resides now. In 1996 he graduated from the Palekh Art School, where he studied under talented Palekh masters Buldakov and Peskov. At present Alexey Yevgenievich works at the Union of Palekh artists. His artworks are held in private collections all over the world. The artwork shows a young man grinding out chess pieces onto a checkered road. Under his orange feet, the box is titled 'Grossmeister' [Grandmaster] and signed 'Palekh, 2006, A.E.Zhiryakov'. With 2321 Flickr views and 89 faves (favorites), this photo has received more than the usual amount of interest. But why? Checkmate © Flickr user Luis Alvarez Marra under Creative Commons. They were so focused that I could spend several minutes photographing. I was seduced by how submerged they were in the game. By the way, I took it on the Pau Buscató Workshop that I attended. It was incredible and I highly recommend it. For those interested, this is the link: www.buscato.net/spw/. That page is titled, 'WORKSHOPS : Pau Buscató : STREET PHOTOGRAPHY'. Add that to the names of some of the 32 groups to which the photo belongs -- 'Street Photography - Fotografia di Strada', 'Street Photographers', and 'Street Scene Shooters', etc. -- and we start to understand that this represents a particular form of art. Pau Buscató is a street photographer from Barcelona, currently based in Oslo, Norway. He studied architecture but after some years of practice abandoned his career to focus exclusively on photography. He is a member of the international street photography collective Burn My Eye. Earlier this year on Flickr Friday we saw a street performer in Posing for Euros (March 2017) and street art in No Monkey Business Here (July 2017). Now we have street photography. An art period is a phase in the development of the work of an artist, groups of artists or art movement. About half of the examples show chess sets (e.g. 'A1' in the upper left and 'C6' in the lower right), while the other half are paintings. The image in 'B3' could be a sculpture, but is in fact a photo of Cubism-Inspired Game Pieces : Artistic Chess Set (trendhunter.com). With so many recognized art periods, there is plenty of source material here. I'll come back to the subject the next time I'm looking for an idea for my daily post. The next group to look at in Spectating the 88th FIDE Congress is the Commission of Chess Journalists, last seen in FIDE's Journalist Commission 2016 (December 2016). For 2017, we first turn to the general report for the 88th FIDE Congress in Antalya, Turkey (fide.com; October 2017). The journalists received three mentions. Day 1: The 88th FIDE Congress started today at the Avantgarde Hotel in Antalya, Turkey. The Congress is organized by the Turkish Chess Federation and attended by the FIDE Executive & Presidential Board, the FIDE Commissions, the FIDE Delegates and the National Chess Federations. 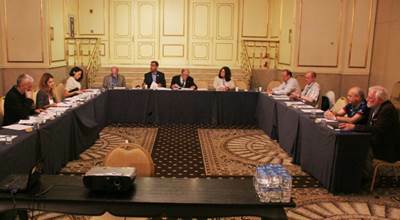 On the first day there were meetings of the Central Board of Commissions, the Marketing Committee, the Technical Commission (TEC), [...] and the Commission of Chess Journalists (CCJ). The Commission of Chess Journalists reviewed the Media Regulations which should be forwarded to the Executive Board for the final approval. The Commission also reported on the progress on issuing the FIDE Journalist accreditations and the plans for the 2018 SportAccord Convention. Media regulations recommended for the approval of the Executive Board. World Chess Championship Matches: The players are obliged to attend the "Media Day" (estimated 120 minutes) and are expected to co-operate reasonably with the media. A. Karlovich informed the meeting about the next SportAccord Convention due for April 2018. There is a proposal that Commission Secretary should travel to this world's biggest sports meeting to establish connections with major journalist organizations and exchange the experience with other sports associations. This promises to be another step forward for chess journalists. The commission has come a long way since I first reported on it in FIDE Journalists' Commission (December 2013; 'A suivre...'). The engines are slugging it out as I write this and have finished 80 games out of the 100 scheduled for the event. Houdini leads [Komodo] with a score of +13-7=60, meaning that we can project a final score of something like +16-9=75. I'll come back to the event when it's over. With its gold medal Houdini becomes the engine with most titles in TCEC history. Robert Houdart shared, "I’ve worked non-stop for the past two years to bring Houdini back to the top level, and I’m really happy that this has resulted in a new TCEC title, which is the equivalent of World Champion status." Komodo Team Reports Compiler Glitch – Version Update Rejected [...] At the beginning of the Superfinal many noticed that Komodo’s speed (in nodes per second) was lower than previously seen. Tournament director Anton Mihailov, with the help of the server administrator Martin Thoresen, double- and triple-checked that the engine was installed correctly. The details were sent to the Komodo team and everyone agreed there was no problem during the Superfinal setup. Statement by team Komodo [...] In summary, there is indeed a slowdown in the version now running in TCEC, which appears to be due to a compiler bug. In a software development chain, the compiler is the tool that translates the high-level code that the developer writes into the low-level code that the processor understands. The Komodo team asked to submit a substitute executable, but the request was rejected by Houdart and Mihailov. TCEC openings for all games of the superfinal were announced in advance and any new version of an engine introduced mid-match might conceivably take advantage of this knowledge. The game of chess is the most widely-studied domain in the history of artificial intelligence. The strongest programs are based on a combination of sophisticated search techniques, domain-specific adaptations, and handcrafted evaluation functions that have been refined by human experts over several decades. In contrast, the AlphaGo Zero program recently achieved superhuman performance in the game of Go, by tabula rasa reinforcement learning from games of self-play. In this paper, we generalise this approach into a single AlphaZero algorithm that can achieve, tabula rasa, superhuman performance in many challenging domains. Starting from random play, and given no domain knowledge except the game rules, AlphaZero achieved within 24 hours a superhuman level of play in the games of chess and shogi (Japanese chess) as well as Go, and convincingly defeated a world-champion program in each case. Tabula rasa refers to the epistemological idea that individuals are born without built-in mental content and that therefore all knowledge comes from experience or perception. We evaluated the fully trained instances of AlphaZero against Stockfish, Elmo and the previous version of AlphaGo Zero (trained for 3 days) in chess, shogi and Go respectively, playing 100 game matches at tournament time controls of one minute per move. AlphaZero and the previous AlphaGo Zero used a single machine with 4 TPUs. Stockfish and Elmo played at their strongest skill level using 64 threads and a hash size of 1GB. AlphaZero convincingly defeated all opponents, losing zero games to Stockfish and eight games to Elmo (see Supplementary Material for several example games), as well as defeating the previous version of AlphaGo Zero. Q: AlphaZero just defeated last year’s champion Stockfish 8. Your opinion on the paper published and the match that took place? A: It’s fascinating and amazing, and at the same time very much expected! We even discussed this during the interview with Nelson and the Komodo authors. It opens entirely new, astonishing possibilities for chess engines! I do hope Google will publish more details about their approach, so that the chess world in general and the computer chess world in particular can benefit from their achievement. Q: Now that Houdini is the reigning champion, would you issue a challenge for AlphaZero? Under what conditions? A: It’s normally up to the challenger to issue a challenge, not the reigning champion :) A big discussion point about a possible match between a "normal" engine and AlphaZero would be the hardware to use -- how can you make sure that hardware is comparable? If I can run Houdini on 2000 cores it will be a lot stronger than when running on 64 cores. That said, I’m not sure how Google is viewing their project -- is it a research/marketing project (like Deep Blue was for IBM), or do they intend to use AlphaZero competitively or as an analysis engine available to the general public? The 'interview with Nelson [Hernandez] and the Komodo authors', which appeared two weeks before the end of season 10 was Interview with Robert Houdart, Mark Lefler and GM Larry Kaufman (chessdom.com). Now that the TCEC event has finished, I would like to look a little more at the technology behind AlphaZero. I started with yesterday's post Giraffe and AlphaZero, which included a link to the DeepMind paper, and will spend the next few Mondays following up. Start with the sociology of chess, last seen two weeks ago in FIDE's Social Commissions 2017, and add artificial intelligence, as in the previous post, A New Style of Chess, about Google/DeepMind’s AlphaZero. What have you got? I didn't know, so I asked Google. Abstract: Since the mid 1960s, researchers in computer science have famously referred to chess as the 'drosophila' of artificial intelligence (AI). What they seem to mean by this is that chess, like the common fruit fly, is an accessible, familiar, and relatively simple experimental technology that nonetheless can be used productively to produce valid knowledge about other, more complex systems. But for historians of science and technology, the analogy between chess and drosophila assumes a larger significance. As Robert Kohler has ably described, the decision to adopt drosophila as the organism of choice for genetics research had far-reaching implications for the development of 20th century biology. In a similar manner, the decision to focus on chess as the measure of both human and computer intelligence had important and unintended consequences for AI research. This paper explores the emergence of chess as an experimental technology, its significance in the developing research practices of the AI community, and the unique ways in which the decision to focus on chess shaped the program of AI research in the decade of the 1970s. More broadly, it attempts to open up the virtual black box of computer software -- and of computer games in particular -- to the scrutiny of historical and sociological analysis. Matthew Lai, a computer scientist at University College London, recently published his master’s thesis, which demonstrated a machine learning system -- called Giraffe, after this cartoon about evolution -- that can learn to play at the International Master level of chess in just 72 hours. According to MIT Technology Review, Lai’s machine is a deep neural network -- a computer system that’s inspired by the structure of the brain and attempts to learn and make decisions in a similar way. According to Lai’s paper, Giraffe performs "moderately better" than contemporary computer programs that analyze every possible move at once, as opposed to the few that might actually lead to success. Matthew Lai. Giraffe: Using deep reinforcement learning to play chess. Master’s thesis, Imperial College London, 2015. Giraffe evaluated positions by a neural network that included mobility maps and attack and defend maps describing the lowest valued attacker and defender of each square. It was trained by self-play using TD(leaf), also reaching a standard of play comparable to international masters. Where to take the subject from here? That will have to wait for another post. Historical moments in chess are few and far between. Here are a half dozen events from the past 50 years that made a big impression on me. Almost all were World Championship matches. Add to these significant career events in the lives of the greatest players. Twenty years ago, chess engines started to take over as the best players. This week we learned of another historical event. One of the best known chess channels on Youtube is Agadmator's. Of the five games he analyzed from the match, here's his first. Although it's still too early to measure the impact of AlphaZero's accomplishment on the future of chess, it will be profound. Earlier this year, in another episode of Video Friday, we saw Kasparov with DeepMind’s CEO Demis Hassabis: Kasparov Talks at Google (June 2017). There will certainly be more discussions to come. With the last two editions of 'Top eBay Chess Items by Price' dominated by big-ticket auctions from Sotheby’s -- A Six-Figure Chess Item at Auction and A Chess Painting and a Namesake -- I haven't had the chance to feature any of the lesser auctions. The item shown below would have made the cut on any average eBay day for 'Top Chess Items'. Titled 'Chess book signed by eight masters, incl. 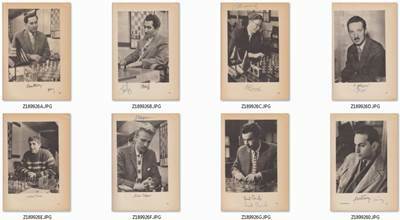 Fischer, Keres, Petrosian, Smyslov and Tal', it sold for around $1500, 'Best offer accepted'. A chess book signed by Benko, Fischer, Gligoric, Keres, Olafsson, Petrosian, Smyslov and Tal: "Kandidatenturnier für Schachweltmeisterschaft" by S. Gligoric and V. Ragozin/Ragosin (Belgrade, 1960). In German. A 320-page hardback in good condition, although the cover is worn (especially on the corners). Ignoring the autographs, several of the photos are well known on their own, e.g. Fischer and Tal, and it's useful to know their source. The wall boards are the same in the background of five photos, indicating that they were taken at the same time. 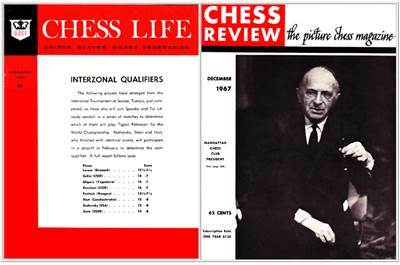 For more about the tournament, see 1959 Yugoslavia Candidates Tournament. For the first time since I started this 'On the Cover' series in 2014, the December edition does not feature a scene reminding us of the year end holidays. The following players have emerged from the Interzonal Tournament at Sousse, Tunisia, just completed, as those who will join Spassky and Tal (already seeded) in a series of matches to determine which of them will play Tigran Petrosian for the World Championship. Reshevsky, Stein and Hort, who finished with identical scores, will participate in a playoff in February to determine the sixth qualifier. A full report follows soon. That full report will recount a dark moment in American chess. My page on the tournament, 1967 Sousse Interzonal Tournament ('Sousse, X-XI, 1967'), says, '[Bobby] Fischer withdrew while leading the tournament after playing ten games of his schedule.' The event was, however, a bright moment in Bent Larsen's career. The 'Doughty Dane', who was featured on the CR side of the November 1967 'On the Cover', finished first with a score of +13-3=5. On the cover this month is Manhattan Chess Club President Jacques Coe. His speech on the 90th anniversary of the club appeared [in November]. In the summer of 1877, while people were still talking about whether Hayes or Tilden should have been President, and the Civil War was fresher in memory than World War II is for us, the Manhattan Chess Club was born. Its members met at the Cafe Logeling, 49 Bowery, between Bayard and Canal Streets, where over their beards they drank lager beer, and under their beards they played chess. The proprietor, Mr. Logeling, kept on hand one of the greatest selections of German, American, English and French newspapers. He was also a chess enthusiast, and eventually built a room over the garden at the back of the cafe which was set aside for the players. The rest of the speech, which covered nearly a full CR page, was a recap of the club's New York residences. A query on this blog (see the search box in the right column) reveals its importance to the history of American chess. Let's wrap up the series on Engine Trouble (September 2017; 'investigate what sort of engine setup I would need to improve my [chess960] result'), last seen in Improve Engine Software - Tablebases, and look at a couple of engine-to-engine tournaments -- a veteran and a newcomer -- that were taking place in parallel with the series. In the few months since I posted about the veteran, TCEC Season 10 Kickoff (September 2017; 'Top Chess Engine Championship'), the competition has reached the final stage. The engines are slugging it out as I write this and have finished 80 games out of the 100 scheduled for the event. Houdini leads with a score of +13-7=60, meaning that we can project a final score of something like +16-9=75. I'll come back to the event when it's over. Chess.com navigation has always been unusual. For this event, if you want to understand it chronologically, you first have to scroll to the bottom of the page then work your way back up, instead of reading the article from top to bottom. The Computer Chess Championship is scheduled for Nov. 13-16, with all four days featuring full live coverage on Chess.com/TV with master commentary and high production values to promote computer chess as a fun viewing experience for the modern gaming audience. The top-two scoring engines in the round-robin will face each other in a thrilling super-final, where time controls will transition from rapid to blitz and finally to bullet chess as the match proceeds. Chess.com will provide four days of live coverage with master commentary, broadcasting all 90 games of the round-robin and all 20 games of the super-final. According to Norm Schmidt, the author of the computer engine Fire and Chess.com's advisor for computer chess, the technical details for the tournament are below. The tournament will be run from an Amazon Web Services server farm located in Northern Virginia. Each engine will utilize its own dedicated AWS virtualized instance of a hyperthreaded Intel Xeon E5-2666 v3 2.90 GHz (two processors each with 18 cores) with 60.0 GB RAM running on Windows Server 2016 Data Center Edition. That 'announcement' includes coverage of the event's two stages: Round Robin Crosstable & Final Standings, plus Superfinal Crosstable. Those results are also summarized in classic top to bottom reporting in a follow-up piece. Day 1: Who's The Strongest Chess Entity On The Planet? Day 3: Who's In The Superfinal? One of these days I hope someone explains to me the difference between a superfinal and a final. In the meantime, I'll continue to admire the likes of Houdini, Komodo, and Stockfish as they go head-to-head in the chess version of core wars. Two weeks ago, in the previous edition of Top eBay Chess Items by Price, we saw A Six-Figure Chess Item at Auction, featuring a Sotheby’s live auction for 'Marcel Duchamp : Pocket Chess Set'. After a starting price of US $160.000, the auction lasted two minutes, with the bid rising by increments of $10.000 every ten seconds or so. The winning bid was $340.000 after 13 bids. By some odd coincidence, this edition of 'Top eBay Chess Items' also features a Sotheby’s live auction for a six-figure painting. The item pictured below was titled 'Edwin Lord Weeks : A Game of Chess', and sold for US $110.000 after 20 bids. Although the item had a starting price of $40.000, the first four bids were under that amount. Once the bidding reached $50,000, the price climbed in increments of $5.000. After years of travel through Europe, North Africa, the Middle East and India, the American artist Edwin Lord Weeks remained captivated by the sights he encountered abroad. Toward the end of his career he began an ambitious series of paintings based on A Thousand and One Nights. Having documented his travels through sketches, paintings and photographs, Weeks was well equipped with the source material for the present scene, and was careful to render the architecture, complete with its delicately carved stone latticework, as well as the costumes of the two figures. The lounging woman is swathed in elaborately embroidered silks, reminiscent of the Nautch dancing girls whom Weeks had painted in India. For the complete description, see the Sotheby’s page, weeks, edwin lord; a game of chess. There we learn that the painting was part of an auction for European Art that took place on 21 November 2017 in New York, that its estimate was 50.000-70.000 USD, that the lot sold for '137.500 USD (Hammer Price with Buyer's Premium)', and that the work is an oil on canvas (55 1/4 by 73 1/4 in., 140.3 by 186.1 cm). Weeks was born in Boston, Massachusetts in 1849. His parents were affluent spice and tea merchants from Newton, a suburb of Boston, and as such they were able to finance their son's youthful interest in painting and travelling. As a young man Weeks visited the Florida Keys to draw, and also travelled to Surinam in South America. The page also mentions, 'In 1872 Weeks relocated to Paris, becoming a pupil of Léon Bonnat and Jean-Léon Gérôme.' The painter Gérôme executed two well known works of caissart titled 'Arnauts playing chess' and 'Almehs playing chess in a cafe', although I'm not convinced that the game pictured in both is indeed chess. 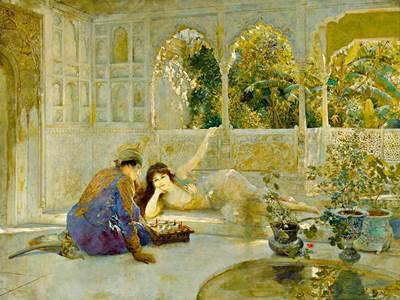 A work similar in composition to those two is 'A game of chess in a Cairo street' by Weeks. Later: Re the sentence 'Although the item had a starting price of $40.000, the first four bids were under that amount', a note at the top of the eBay page says, 'Live auction bidding may start higher or lower'. I assume this means 'higher or lower than the starting price'. A link at the bottom of the page leads to: How live auctions work (at Sotheby’s). Today's Flickr Friday post became Flickrless Friday when I was unable to find an image to suit my taste. I found a couple of photos worth adding to my 'Flickr Favorites' (see the right sidebar for the latest), but nothing worth further investigation. What to do? Borrowing an idea from last week's post Sotheby's Chess, I produced the following composite image of Flickr chess paintings. It shows the first screen of 4.118 images. Call the rows 'A' to 'C' (from top to bottom) and number the images in each row '1' to '7' (from left to right). ...is there anything here that will advance our knowledge of anything else? For example, what does that image in the upper left corner ('A1') have to do with chess? Titled Captain Rex Snow Assault, it's in four groups having names like 'Lego Star Wars'. The only association with chess is via a white tag assigned by Flickr, i.e. if the image looks like a group of chess pieces, let's assign it to 'chess'. We already saw this in Giant Chess Pieces in Mandalay (February 2016), and know that the Flickr robots are over-enthusiastic when it comes to tagging things. How about the image in the lower right corner ('C7')? Titled Kayla, the description says, 'Her main work consists of murals depicting computers playing chess with genetically enhanced parrots.' That sounds like a sentence generated by a text-writing robot. Apparently, software robots in the year 2017 do not advance our knowledge of anything. After this, there are a pair of similar images in 'B7' & 'C4' showing a yellow dog wearing sunglasses (or something like that). The 'B7' image is titled From gallery chess P1150440, which is as close to chess as the page comes. The C4 image is from the same photographer with a similar title. Why 'gallery chess'? Of the various searches I used to research this question, none answered it. This and its companion panel are from the front of a chest (cassone) and show two episodes from an as yet unidentified story, or novella. In one, a youth is smitten by a maiden who appears at a window. In the other, they engage in an erotically charged game of chess (she is about to lose). Both were common themes in the amatory literature of the Renaissance. While this image shows the 'maiden who appears at a window', the mention of metmuseum.org and of Liberale da Verona eventually leads to Liberale da Verona | The Chess Players | The Met, a well known chess painting dated 'ca. 1475'. Another potential example from the 'amatory literature' of chess (seriously?) is in 'C2': The Chess Players by Jacques Clément Wagrez (1846-1908 France). While trying to find more about this piece, I was inundated by copies from Pinterest.com and gave up. That's another lesson from this exercise. Images copied to Flickr or to Pinterest, without a smidgen of additional explanation, don't advance our knowledge of anything. I hope to have a real Flickr Friday post two weeks from now. If not, I'll explore those little colored boxes at the top of my screen capture.